Reverberations | Prayer, Pentecostalism, and the Political: Renewing the Public Square? Persistent intercessory prayer, for which some pentecostals are known (carrying on the older Holiness practice of tarrying), changes things, even the prayers themselves. Sometimes, our prayers move us to action. 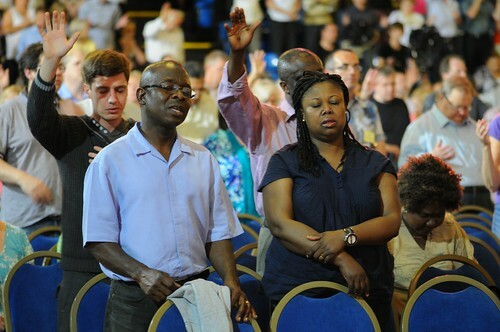 Within a pentecostal context, ongoing prayer for the political over a prolonged period of time is usually explained as being the result of divine prompting resulting in a “burden” that will not be otherwise dismissed; Pentecostals are often too focused on mission and evangelism, not to mention the mundane things in life that are the concern of all human beings, to otherwise devote concerted effort to political prayer. In certain pentecostal contexts, however, charismatic leaders who have come to see beyond a sacred-secular dualism may lead a congregation into seasons of political praying, in which case parishioners will follow their man or woman of God. The point is, however, that when a people is moved to pray for the political, in some instances they are also galvanized to act publicly, even politically, to the degree that such activities are not cost-prohibitive. These undertakings and behaviors usually remain at the grassroots level, although in rare instances, they may generate sustained political initiatives. Demographers tell us that this second pentecostal century (following the theory that locates the origins of the modern pentecostal movement at the Azusa Street revival in Los Angeles in 1906-1908) will feature an increasingly pentecostalized and charismatized global Christianity. If these trends continue to happen, the classical pentecostal suspicion about engaging in the political arena will be in turn an increasingly minority perspective. Such a global renewed Christianity will come more and more to see their prayer and spirituality as intertwined with their lives in the public square. In these cases, pentecostal and charismatic commitments will also be understood as having public consequences, implications and applications – i.e., in the social, economic, civil, and even political realms – and vice-versa. While neither a prophet nor the son of one, I am inclined to think that this overcoming of the dualism between the ecclesial and the public domains will bring with it new opportunities and new challenges for Christianity in the twenty-first century. The challenges will include some confusion about what Christian discipleship entails in relationship to the public square; the opportunities will involve a renewal of Christian faith in the present time even as it may portend the renewal of the public sphere through Christian presence and activity. Will such prayer and its accompanying behavior always reflect the will of God in those spaces and times? These judgments are often definitively registered only with the next generation of those who remain engaged in prayer vis-à-vis the political.